'Father, Son And Holy Ghost' sees Girls truly exploring their ambitions, producing a near-masterpiece of an album. At nearly an hour in length and with many songs over the four-minute mark, this is a record that does demand the attention of the listener but it’s very hard to imagine there will be a more rewarding record released in 2011. A hazy, romantic feel is present throughout the album as Girls have clearly taken a turn for the soulful and introspective. Reflecting the growing confidence of the band, there is a clear sense of purpose to the record, which makes it greater than the sum of its parts. The innocence and vulnerability of band founder Christopher Owens’ vocals make self-references such as "They don’t like my bony body/They don’t like my dirty hair" and "I need a woman who needs me! Me! Me! Me!" on opener 'Honey Bunny' come across as endearing rather than indulgent. To reinforce the surf guitar sound, the chorus borrows the melody from the Beach Boys’ 'Fun, Fun, Fun'. Indeed, Owens clearly knows his rock history as the album is reminiscent of the great sprawling records by Pink Floyd, Elvis Costello and the Rolling Stones. Even though the melodies feel instantly familiar, it’s to Owens’ credit that 'Father, Son, Holy Ghost' is by no means derivative and sounds like nothing else in the current alternative rock scene. The arrangements and musicianship are of the very highest class, with the deftest flicks delivering an emotional punch, demonstrated by the brilliant key change in 'Vomit'. 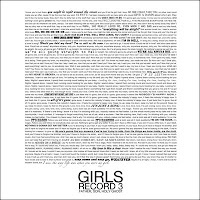 The economy of the lyrics makes each line all the more impactful and to illustrate the point, the full content of the lyrics are printed on the album cover. 'My Ma' and 'Vomit' form the heart of the record and their combined impact is hugely affecting. Both are mini-epics , featuring electric organs and gospel singers which give them an almost transcendent, hymn-like quality. It’s followed by the pretty lament of 'Just A Song' and when Owens croons that "Love, love, love/Is just a song" you know he’s not even convincing himself let alone the listener. 'Magic' provides some respite, with its bouncy melody and is probably the most lightweight song on the record. The hardest rocking tracks are at the start of the record with the grungey, propulsive 'Alex' and 'Die', the latter of which boasts a 80s style metal riff that Ritchie Blackmore himself would be proud. In contrast, the final three tracks are slower ballads, which display the range of Girls’ abilities, in particular 'Forgiveness' which meanders along nicely before it’s abruptly broken by an electric guitar solo as if to stir the listener out of its spell. 'Jamie Marie' is an exquisite closer, which features a lovely electric organ outro that can’t help bring a smile to the listener. With each record, Girls are evolving and Owens is a truly prodigious talent. In many ways, 'Father, Son And Holy Ghost' is a concept album about love, exploring all its various emotions which means there are more mood shifts than the British weather. Although it’s a subject covered time and time again in music but rarely has it been done so wonderfully and honestly. Ultimately, you come away from the record thinking that while love can be demoralising as well as exhilarating, it’s always worth pursuing – and there really can be no greater message than that. 'Father, Son And Holy Ghost' is available at your local retailer, iTunes and amazon.co.uk. Stream in full in the artwork widget above.